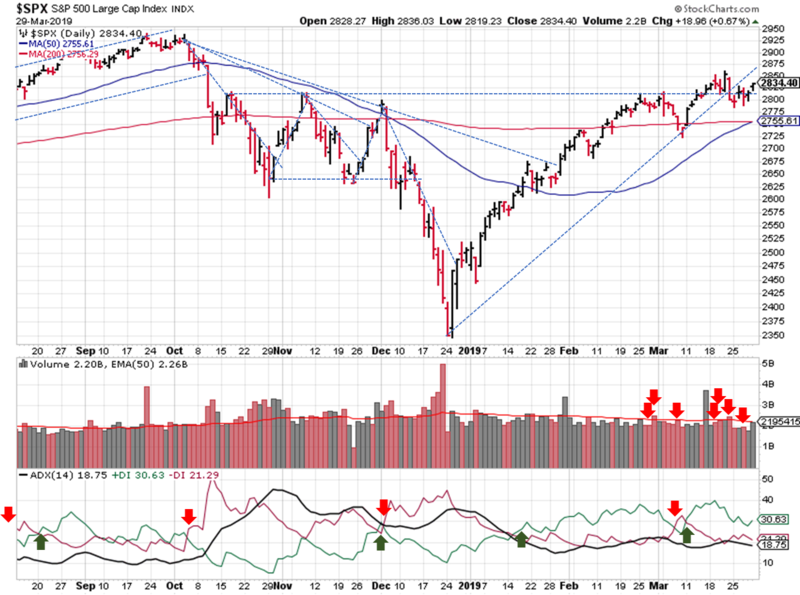 No signal changes this week; markets hit a small rough patch but the uptrend remains. In the weekly view, the S&P's 10 & 40 week moving crossed over (bullish), but didn't do much to confirm anything from a trendline perspective. Switching to a daily view, the S&P500 ($SPX) starts the week just above the resistance trendline going back to Q4 of last year (bullish), the 50 & 200 day moving averages are about to cross (bullish), and prices were unable to recover the recent uptrend from late December (bearish). The DI+ / DI- remains in bullish territory. Price/volume weakened from uptrend to mixed, as the high-volume gains we were looking for didn't materialize. 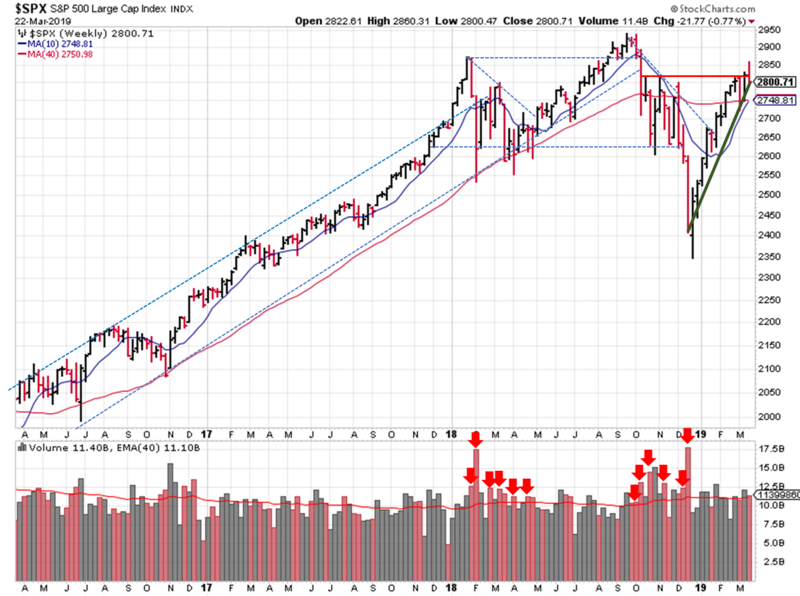 Instead, the S&P picked up 3 more distribution days...a clear sign of institutional selling. Price is still above the 50-day moving average. The DI+ / DI- remains in bullish/uptrend territory. Price/volume weakened a bit, thanks to another distribution day, so the signal remains mixed. And the OEW group continues with their uptrend call, with 2 weeks of weak price action behind us. Undoubtedly, you've read a lot about the correlation between yield curve inversion and recession. Head over to The Fat Pitch blog to read a bit about the historical correlation between the price moves seen during Q1 and market performance over the rest of the year. Neither datasets are fool proof, but it pays to evaluate your process in light of both. If you find this research helpful, please tell a friend. If you don't find it helpful, tell an enemy. I share articles and other news of interest via Twitter; you can follow me @investsafely. The weekly market outlook is also posted on Facebook and Linkedin. Charts provided courtesy of stockcharts.com. If you're interested in learning more about the relationship between price and volume, or how to find and trade the best stocks for your growth strategy, check out this book on Amazon via the following affiliate link: How to Make Money in Stocks: A Winning System in Good Times and Bad. It's one of my favorites. For the detailed Elliott Wave Analysis, go to the ELLIOTT WAVE lives on by Tony Caldaro. 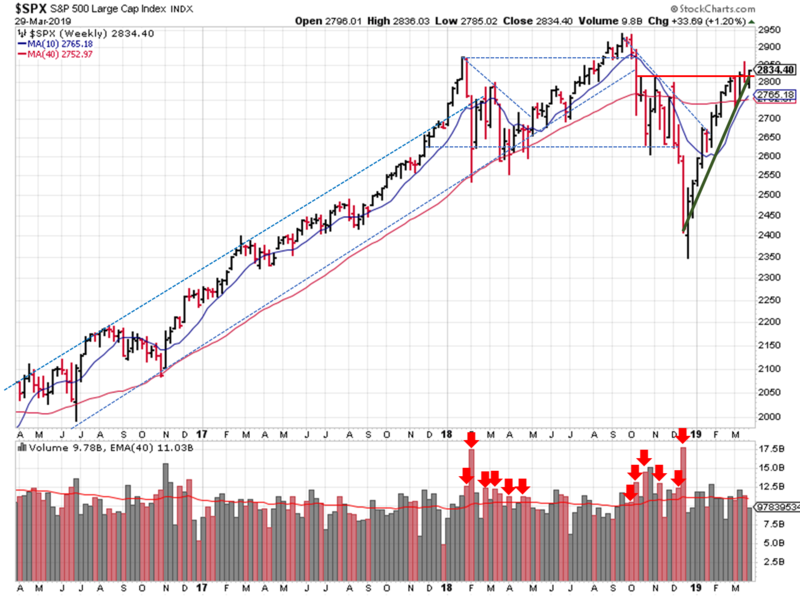 Once a year, I review the market outlook signals as if they were a mechanical trading system, while pointing out issues and making adjustments. The goal is to give you to give you an example of how to analyze and continuously improve your own systems. This material is for general communication and is provided for informational and/or educational purposes only. None of the content should be viewed as a suggestion that you take or refrain from taking any action nor as a recommendation for any specific investment product, strategy, or other such purpose. Certain information contained herein has been obtained from third-party sources believed to be reliable, but we cannot guarantee its accuracy or completeness. To the extent that a reader has any questions regarding the applicability of any specific issue discussed above to his/her individual situation, he/she is encouraged to consult with the professional advisors of his/her choosing. Invest Safely, LLC is not a law firm, certified public accounting firm, or registered investment advisor and no portion of its content should be construed as legal, accounting, or investment advice. The material is not to be construed as an offer or a recommendation to buy or sell a security nor is it to be construed as investment advice. Additionally, the material accessible through this website does not constitute a representation that the investments described herein are suitable or appropriate for any person. Any referenced performance is “as calculated” using the referenced funds and has not been independently verified. This presentation does not discuss, directly or indirectly, the amount of the profits or losses, realized or unrealized, by any reader or contributor, from any specific funds or securities. Past performance may not be indicative of future results. Therefore, no one should assume that future performance will be profitable, or equal to any corresponding historical index. The S&P 500 Composite Total Return Index (the "S&P") is a market capitalization-weighted index of 500 widely held stocks often used as a proxy for the stock market. Standard & Poor's chooses the member companies for the S&P based on market size, liquidity, and industry group representation. Included are the common stocks of industrial, financial, utility, and transportation companies. The S&P is not an index into which an investor can directly invest. The historical S&P performance results (and those of all other indices) are provided exclusively for comparison purposes only, so as to provide general comparative information to assist an individual in determining whether the performance of a specific portfolio or model meets, or continues to meet investment objective(s). The model and indices performance results do not reflect the impact of taxes. Investing involves risk (even the “safe” kind)! Past performance does not guarantee or indicate future results. Different types of investments involve varying degrees of underlying risk. Therefore, do not assume that future performance of any specific investment or investment strategy be suitable for your portfolio or individual situation, will be profitable, equal any historical performance level(s), or prove successful (including the investments and/or investment strategies describe on this site).